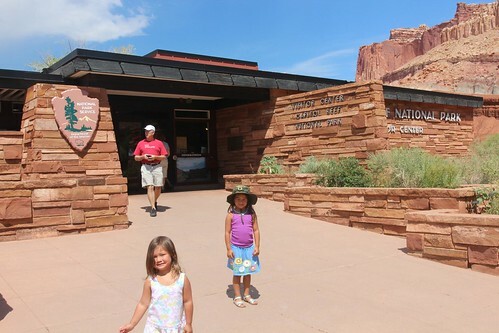 Mali Mish - Day 8: Fruita, Utah and Capitol Reef National Park. 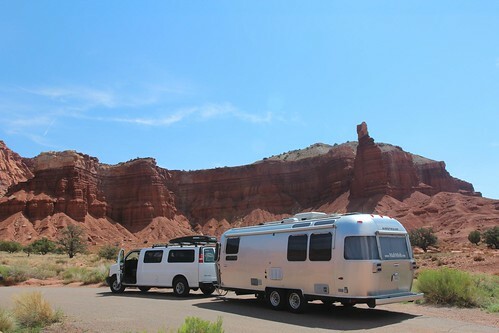 Day 8: Fruita, Utah and Capitol Reef National Park. Our night at Wonderland RV Park was brief. 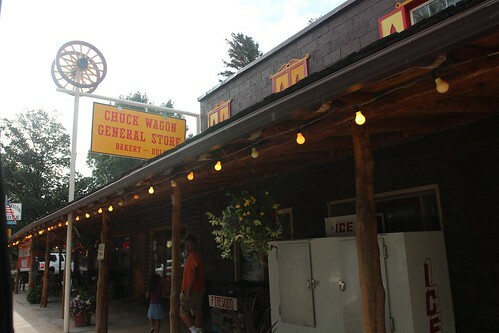 In a more populated area, we would have found a place to boondock instead. But since our 3G card doesn’t work real well, we opted to pay for the night since they promised a great wifi connection. Well, the connection was less than great up until about 11PM. Once everyone went to bed, I was able to take better advantage of it. Our original plan to drive to Fruita yesterday would not have been the best idea. Even thought Fruita was once a town, it has not had a proper resident since the 1960s. The last resident, Dewey Gifford, sold his property to the National Park System in 1969 and relocated. 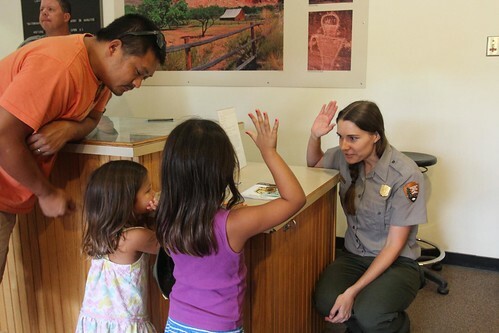 The town is basically a national preservation region located inside Capitol Reef National Park. As we headed east on Route 24 towards Capitol Reef, you can start to see more of the same amazing rock formations throughout this part of Utah. Once we entered the National Park, which is nothing more than just a sign on the side of the road, we pulled over at the first scenic pull out called Chimney Rock, named after the smokestack formation towering next to the cliffs. 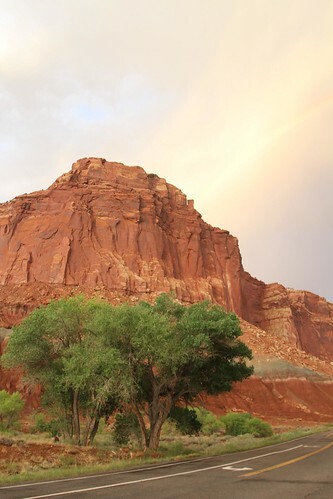 As compared to Bryce Canyon, Capitol Reef is much less crowded. The visitor center has a couple dozen parking spots and it was probably 80% full. 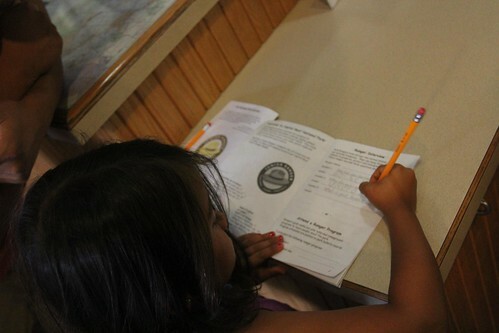 We headed in for some information about the campground as well as getting more workbooks for our little junior rangers. This time, we made sure to let Mila join in on the action. The campground consists of 3 loops about a mile in from the visitor center. 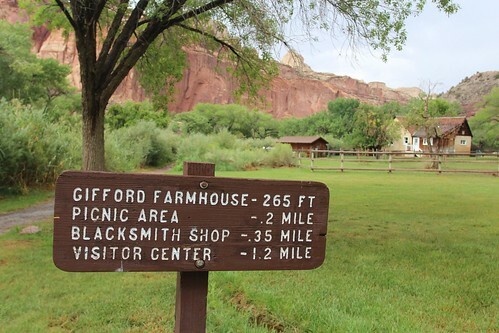 We picked a spot right next to the Gifford farmhouse that has since been renovated to showcase the pioneering Mormon homesteaders in this regions history. The original home was built by polygamous Calvin Pendleton in 1908. He had two wives and several children who lived here for 8 years before the second owner Jorgan Jorgenson moved in. He lived there until 1928 when he sold it to his daughter’s husband, Dewey Gifford, who lived in it until 1969. Our campsite backs up right against the field behind the farmhouse. The views are stunning and for only 10 bucks a night, we feel like we are robbing them. Along the edge of the campground and the farmhouse is the Fremont River that flows year round. This area is a true desert oasis and has had a human population for thousands of years. Within a half hour of us getting here, it started pouring rain by the buckets. It is pretty typical for rain to come and go here during this time of year. We have experienced as much in the last week since we have been here. Once the rain stopped, we headed over to check out the Gifford house. One the way there, you can see the rushing river after a quick rain. 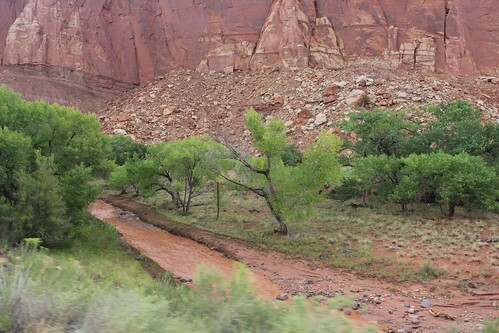 It carries so much of the brownish, red dirt from the area it aggregated upstream, Ava called it a river of chocolate milk. 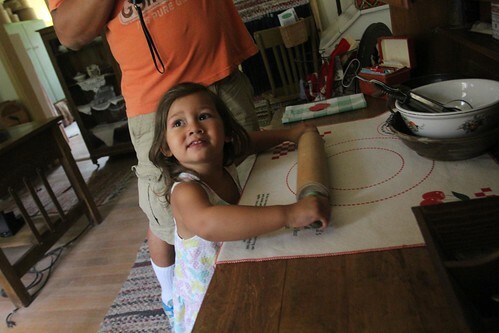 Inside the Gifford house, we got a glimpse of the pioneering spirit of the Mormon homesteaders. They had no electricity or running water yet they were not only self-sufficient but also helped others in the community. 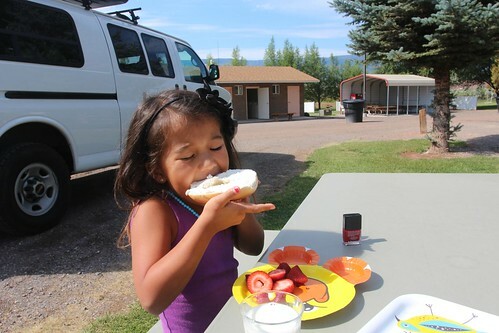 There were never more than 10 families at any time in Fruita and everyone worked and helped each other in this remote community. The grew their own food and planted orchards irrigated by diverting water from the Fremont river. They also raise livestock such as cattle, sheeps and chickens. Without the Fremont river, Fruita would not have existed. 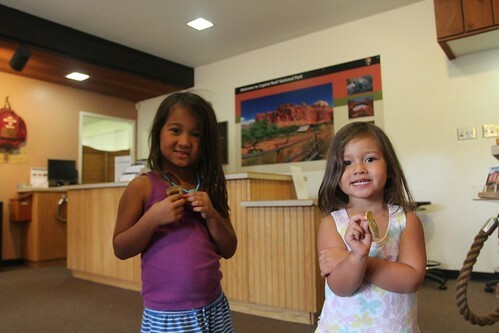 In fact, the Hopi and Zuni Indians inhabited this area over a thousand years ago for the same reason. 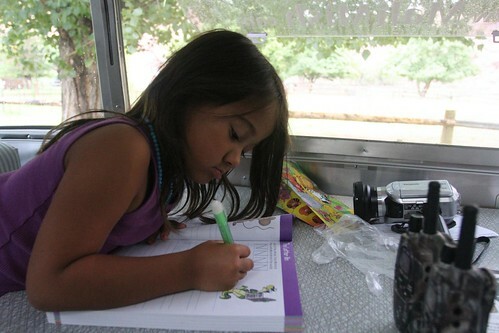 When we finally got back to the campsite, we helped the girls work on their Junior Ranger projects. Mila is still too little for it as she can’t really work in the book on her own. All she knows is that Ava is going to get a badge and she is not going to miss out again. Ava on the other hand is now a pro at this thing. 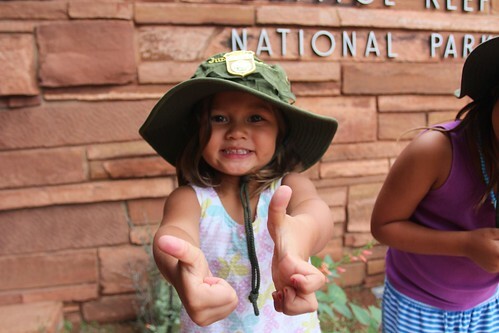 With her second Junior Ranger badge in the same week on the horizon, she powered through the projects and even opted to do more than her required sections just for fun. No sad Mila this time. She weaseled her way into a badge with help from her sister. Yeah, we even got her a hat. This is quite the opposite reaction from Bryce Canyon. Ava has now doubled up on her Natonal Park loot. 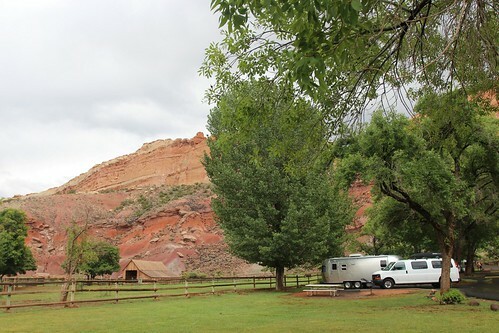 At the campgrounds of Capitol Reef, there are no outside services of any kind. Even to buy fire wood for your camp fire, you have to drive back into Torrey. It’s only a 15 minute drive each way and it is actually quite scenic. Having been in these small towns for over a week, we are running short on some of our supplies. As the weekend is coming up and I was able to wrap up my work obligations until Sunday afternoon, we decided to make our stay through the weekend. The only complaint we have about this area is the flies, mosquitos and gnats. 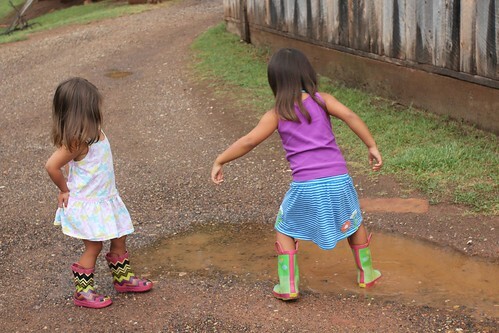 The thunderstorms are often leaving puddles of water on the ground for them to breed and even though mosquitos are not known for being a desert problem, it is one for us here. 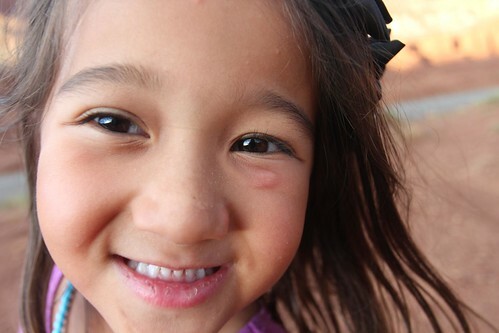 We all got bit several times since we got here and Ava has a nice one right under her left eye. Mila has them around her eyes and forehead too. She decided that a good way to keep the bugs away is to scare them away with a monster face. On our way back from Torrey, a huge rainbow appeared amid the storm clouds. 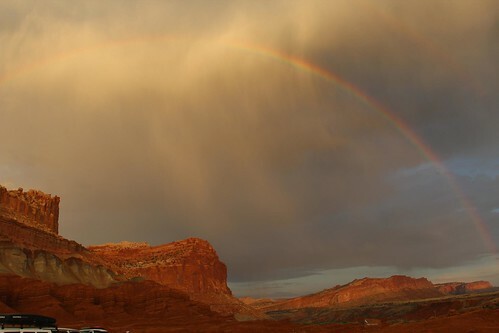 The amazing rock formations, thunderstorm clouds with a rainbow AND a family of deers? That is just ridiculously awesome. Are you kidding me? Day 7: Climbing the Summit through Utah’s Scenic Byway 12. Day 9: Petroglyphs, Old Schoolhouse and the Fruita Orchards. 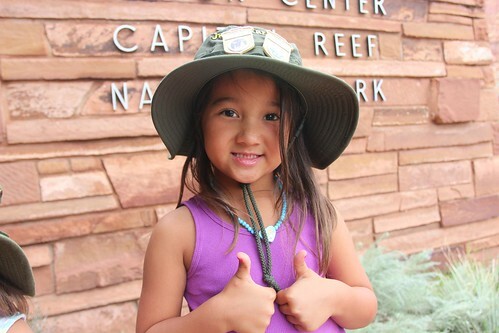 4 Responses to Day 8: Fruita, Utah and Capitol Reef National Park. If you leave the park do you put your fire out or leave it burning? Leave it burning! Mila cracks me up. Leave the fire burning and run around like crazy… Glad to see she got a badge, maybe at the next park they will let her do it again. Beautiful campground especially for only $10 thats amazing. How does Yoda do on the road? Seems like he does great and even answers you after you ask him a question. Be safe as always, and have fun.. Awesome pictures. What a great time. I love reading your blog because I learn too. You have a great family and are doing a great job raising them. Fun fun fun! Thanks, ladies! Mila’s answers are still cracking me up. 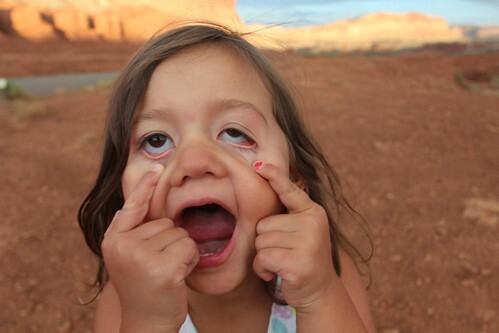 She is our silly kid, for sure! @Charlene Yoda doesn’t seem to mind the road. She sleeps most of the day anyway. In the Airstream, she hides under the bed or is watching wildlife out of our windows. Not a bad life!